For some office worker that has so many important files, maybe you need to zip or unzip and also save email as PDF on iPhone 8. Maybe some the university students also need it to make the file simple and will open it easily. Through the pdf file, you will save, share and also view it easily through many media like PC, Android, Mac and absolutely iPhone. The way is really simple and you don’t need to download and use the other application. So let try it soon guys. 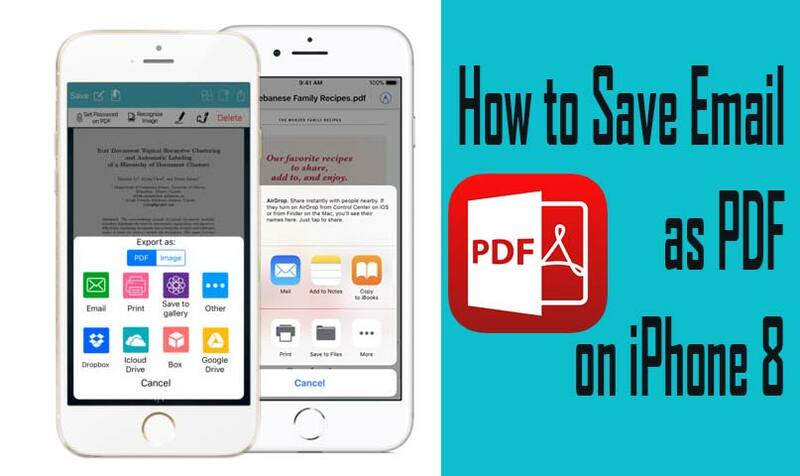 Saving email as PDF on your iPhone 8 is really easy. Follow the guide below. Through the iPhone 8, choose the email that you want to save as the pdf document. Let’s preview the file to see what the email look like if you print the file. You will pinch it to zoom it out and see the bigger size on the image preview of the email that you want. Please press the preview firmly if you are using the iPhone 8. The preview of the screen will appear on the entire screen and now you find it in the pdf format. Next press the share icon that place in the right corner of the screen. Now you will share the PDF file that generated by email, SMS, and many more. You will save it through the drop box, iCloud files, and another application. It depends on the applications that ready and installed in your iPhone 8. If you still confused how to do it by your iPhone 8, you will use another device like Mac. Let’s follow the steps how to convert an email to PDF on Mac. Choose the location to save the PDF file as you want and safe enough. By using the Mac, you will select to save it to the desktop and then click save. Well, after it kept in the desktop, you will obviously share it for someone by using email. Besides that, you will leave it in the folder inside your computer as the backup. So your file is safe and you will get it whenever you need it. Well, to save email as PDF on iPhone 8 is very easy to do, right? It will give any benefit to you and absolutely make your work feel easier. Let’s try it soon guys.